"With respect to the second observation period O2, the Virgo sensitivity has improved by about a factor of 2, which means that the volume of the observable Universe has increased by a factor of 8", says Alessio Rocchi, researcher at INFN and Virgo’s commissioning coordinator. "The quality of the data collected by the instruments is a determining factor to detect gravitational-wave signals buried into noise and to measure their properties", said Nicolas Arnaud, CNRS researcher currently seconded to EGO and Virgo detector characterization coordinator. "A lot of progress has been made in that direction since O2, thanks to the combined effort of the collaboration as a whole, from the instrumentalists to the data analysts". "The new software we have built is able to send Open Public Alerts within five minutes", says Sarah Antier, postdoc at the Université Paris Diderot and responsible of the low latency program for the Virgo Collaboration. "This will allow to follow-up the gravitational wave signal with neutrino and/or electromagnetic searches, that may lead to multimessenger discoveries. Observations of many signals as we expect during O3 will give us a census of the population of stellar mass remnants and a better understanding of the violent Universe." Today March 4th, 2019 the Advanced LIGO and Advanced Virgo detectors are starting their 14th Engineering Run. ER14 will last at least four weeks: it will be the final test before the start of the 3rd LIGO-Virgo Observation Run (O3). During the first half of the run activities will be scheduled that might still improve the three interferometres in the network. ER14 will allow scientists to perform long-term tests of the detector stability, as well as to check the readiness of the software that analyses data in real time. No automatic open public alerts will be issued during this period: any significant candidate trigger identified in the data would have to pass human vetting first. The successful completion of ER14 will lead the path to the one year-long O3 science run: O3 will be the longest period during which the global network of advanced gravitational-wave detectors will be observing the Universe with unsurpassed sensitivity. Since the end of the O2 science run in August 2017, the LIGO and Virgo Collaborations have continued working on their instruments to improve their performance. The figure on the left shows how the sensitivity of Advanced Virgo has progressed steadily over the past months. LIGO and Virgo have made publicly available the strain data from the O2 observing run. These data are now available through the Gravitational Wave Open Science Center. The O2 observing run began on the 30th of November, 2016 and ended on the 25th of August, 2017. This was the second observing run of Advanced LIGO, and the first observing run of Advanced Virgo, which joined O2 on the 1st of August, 2017. The release includes over 150 days of recorded data from each of the two LIGO observatories, as well as 20 days of recorded data from Virgo, making this the largest data set of 'advanced' gravitational-wave detectors to date. Observations in O2 include seven binary black hole mergers, as well as the first binary neutron star merger observed in gravitational waves, all recently published in the GWTC-1 catalogue. Along with the strain data, the release contains detailed documentation and links to open-source software tools. As with previous data releases, the O2 data set should be useful for both scientific investigations and educational activities. The figure on the left shows the sensitivity achieved during O2 of the three detectors in the network. Advanced Virgo scientists are preparing for the upcoming third LIGO-Virgo scientific Observation Run (O3). Advanced Virgo and Advanced LIGO have scheduled engineering runs to prepare for O3. The four-day engineering run, ER13, was completed on the 18th of December, 2018; more details are available here. In particular, ER13 allowed for an end-to-end test of the procedure for releasing Open Public Alerts. These alerts will notify the physics and astronomy community whenever a potential gravitational-wave transient event is observed. As these alerts need to be circulated within a short time frame, a rapid response team is charged with guaranteeing their quality. A second engineering run, ER14, is scheduled for March 2019. ER14 will last approximately four weeks and will be followed by the third LIGO-Virgo scientific Observation Run (O3). An updated timeline can be found here. Advanced Virgo has to improve further in terms of sensitivity and stability of operation in order to meet O3 requirements. One of the ER14 milestones will be the enhancement of Advanced Virgo sensitivity through the use of squeezed-light. More details about Advanced Virgo upgrades are listed here. The picture on the left shows a detail of the optics used to inject the squeezed-light into Advanced Virgo. Today, Friday December 14th 2018, the 13th Engineering Run (named 'ER13') has started. It will last four days until next Tuesday, the 18th of December. During ER13, the Advanced Virgo and Advanced LIGO detectors will operate together, forming a world-wide network. The purpose of this run is to check the progress achieved so far and to collect indications on how to further tune the detectors, the online data analysis pipelines, and the procedure for releasing Open Public Alerts, which will notify the physics and astronomy community when a potential gravitational-wave transient event has been observed. 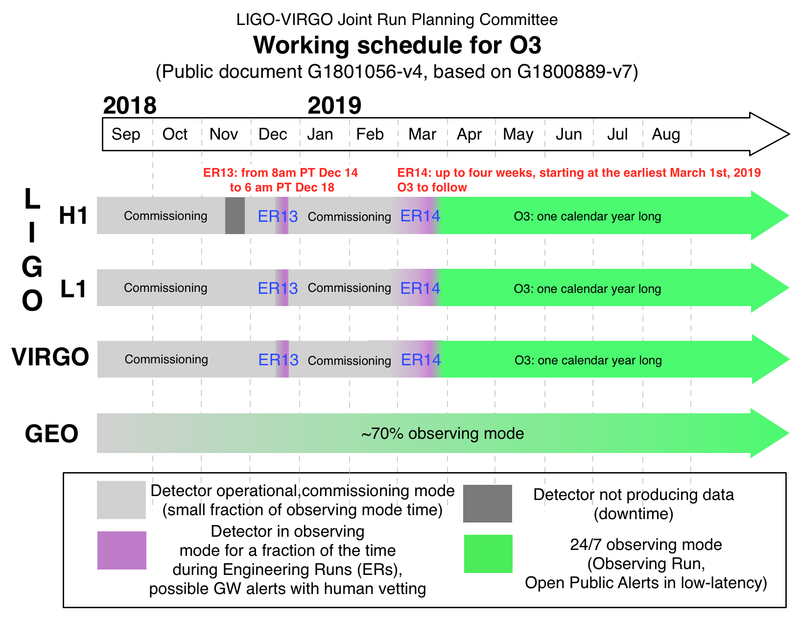 The third LIGO-Virgo scientific Observation Run (O3), the goal of which will be to make astrophysical observations, will follow one more Engineering Run - ER14 - which is scheduled to take place a few months from now. An updated timeline towards O3 can be found here. Since the end of August 2017, when the successful second Observation Run (O2) concluded, Virgo and LIGO scientists have been working intensively on the interferometric detectors and associated algorithms with the aim of improving observation capabilities. More details about Advanced Virgo upgrades are listed here. O2 was a great success, bringing with it the first ever events measured by the global 3-detector network - such as GW170814, GW170817 (the first detection of gravitational waves produced by colliding neutron stars) and GW170818 (another triple detection of a binary black hole merger recently made public). It was also the birth of multi-messenger astronomy with gravitational waves. Overall, the LIGO and Virgo collaborations have now confidently detected gravitational waves from a total of 10 stellar-mass binary black hole mergers and one merger of neutron stars: the collaborations have just released their first catalog of gravitational-wave events GWTC-1 (more information is available here). "ER13 is the first common Virgo-LIGO milestone towards O3", says Alessio Rocchi of the Italian National Institute for Nuclear Physics (INFN) who is coordinating the commissioning efforts of the Virgo Collaboration. "It represents an essential step towards the Open Public Alert era and is the first occasion on which all of the infrastructure of the EGO observatory will be thoroughly tested. Thanks to the hardware upgrades installed over the last year and the commissioning activities, the Virgo sensitivity has increased by about 60% with respect to O2. Thus, we might even expect some surprises." The composite image on the left shows the sun setting over Virgo at the European Gravitational Observatory (EGO) near Pisa, Italy, and a typical scene in the Virgo Control Room; the place in which many of the scientists engaged in the commissioning of the detector carry out their work. It is also where they all meet on a daily basis to discuss issues, activities and the latest news related to the detector. The figure on the left shows the localizations of the various gravitational-wave detections in the sky. The triple detections are labelled as HLV, from the initials of the three interferometers (LIGO-Hanford, LIGO-Livingston and Virgo) that observed the signals. The reduced areas of the triple events demonstrate the capabilities of the global gravitational-wave network. As planned, the Virgo and LIGO detectors stopped taking data for the ‘Observation Run 2’ - O2 - on the 25th of August, 2017. For both collaborations, this marked the beginning of a new and busy period, which is scheduled to last at least one year (see timelines on the left). During this time, the sensitivity of all three instruments (that is, their ability to detect signals even fainter than those observed in 2015 and 2017 or coming from similar sources, but located further away in the universe) should be improved significantly. Then, in early 2019, the data-taking period – O3 – will start and last for about one calendar year. On the Virgo side, three phases were foreseen. First, commissioning activities were undertaken until mid-autumn, in order to improve our knowledge of the detector configuration that was used to take data, and to fix issues identified during the August 2017 run. Indeed, for all large facilities such as Virgo, the golden rule is to disturb the instrument as little as possible while it is running. Only issues preventing the taking of data are promptly fixed and only straightforward improvements are allowed. Therefore, it was only after the end of the O2 run that people working in the Virgo control room were able to carry out many different tests and modify the hardware and software configurations of the detector. The installation of a more powerful, ultra-stable input laser: the larger the power circulating in the detector, the more sensitive it is, in particular in the high-frequency range: above a few hundred hertz. With the new laser, the O3 input power is expected to increase by up to a factor of three in comparison with the O2 data-taking period. The replacement of the steel wires suspending the mirrors forming the 3-km long Fabry-Perot cavities - four mirrors in total - with fused silica - ‘glass’ - wires. This lower-dissipation material helps in reducing friction at the anchor levels, hence the suspension thermal noise, which represents the dominant fundamental noise impacting upon the Virgo sensitivity in the medium-frequency region, where it is at its best. These fibers have high breaking strengths, but they are fragile, which makes the whole process - from the production of the fibers in a dedicated lab at EGO, to the suspension of the mirror from its superattenuator structure - challenging. In parallel, the vacuum quality has been improved. About a year and half ago, particle contamination of the vacuum caused some fused-silica fibers to break inside the detector. At that time, the mirrors were again suspended from steel wires and the upgrade to fused-silica fibers was postponed to the O2-O3 long shutdown. The addition of a squeezed vacuum source - a ’squeezer’ - provided by the Albert Einstein Institute in Hannover, Germany. This instrument, installed at the output port of the interferometer - where the power exists that results from the interference between the laser beams circulating in the 3-km long arms - helps to ’beat’ the quantum noise limit, i.e. to reduce the laser shot-noise, which is dominant at high frequency, below its normal level. This counter-intuitive effect is due to the quantum nature of light: any electromagnetic wave, such as the Virgo laser beam, is defined by two quantities, an amplitude and a phase, both of which are fluctuating. The fluctuations of the phase – also known as ’phase noise’ – matter more than the amplitude fluctuations for Virgo. With a squeezer, one can move part of the phase noise to the amplitude noise – the Heisenberg principle states that one cannot decrease both fluctuations: if one goes down, the other should increase – and hence improve the instrument sensitivity. This technique has been successfully implemented in GEO 600 and LIGO: this is the first time it will be tried in Virgo. Following the completion of all of these upgrades, Virgo is now back in commissioning mode. The first aim is to learn how to control the detector, which has been significantly modified, and then to improve the sensitivity – by at least a factor of two by the end of the year. This will be challenging but the first results are promising: the best O2 sensitivity – the all-time record sensitivity for Virgo – was surpassed in early June. The image shows the localization of the gravitational-wave (from the LIGO-Virgo 3-detector global network), gamma-ray (by the Fermi and INTEGRAL satellites) and optical (the Swope discovery image) signals from the transient event detected on the 17th of August, 2017. The colored areas show the sky localization regions estimated by the gamma-ray observatories (in blue) and by the gravitational-wave detectors (in green). The insert shows the location of the apparent known galaxy NGC4993: on the top image, recorded almost 11 hours after the gravitational-wave and gamma-ray signals had been detected, a new source (marked by a reticle) is visible: it was not there on the bottom picture, taken about three weeks before the event. Press release - Communiqué de presse - Comunicato stampa - Persbericht - Notas de prensa - Materiały dla prasy - Sajtókiadványok. A fourth gravitational-wave signal coming from the merger of two stellar mass black holes located about 1.8 billion light-years away was detected on the 14th of August 2017, at 10:30:43 UTC. GW170814 is the first event observed by the global 3-detector network, including not only the two twin Advanced LIGO detectors but the Advanced Virgo detector as well. Following a multi-year upgrade programme and several months of commissioning, the Advanced Virgo detector joined the LIGO "Observation Run 2" data-taking period on the 1st of August. The three instruments worked together until the 25th of August. GW170814 demonstrates the potential of a 3-detector network, both in terms of localization of a source in the sky and in terms of the testing of Einstein's theory of general relativity. The best GW170814 skymaps, computed by an analysis that uses all of the available information from the three instruments, cover just 60 square degrees (to be compared with several hundreds of square degrees for the LIGO-only network) and GW170814 data have allowed the LIGO-Virgo collaboration to probe, for the first time, the polarization of gravitational waves. Therefore, GW170814 holds great promise for the future of multimessenger astronomy. Additional results, based on data from the three-detector network, will be announced in the near future by the LIGO-Virgo Collaboration; the analysis of the data is currently being finalized. The press release is available in English - French - Italian- Dutch - Polish - Spanish - Hungarian. The Virgo and LIGO Scientific Collaborations have been observing since November 30, 2016 in the second Advanced Detector Observing Run ‘O2’, searching for gravitational-wave signals, first with the two LIGO detectors, then with both LIGO and Virgo instruments operating together since August 1, 2017. Some promising gravitational-wave candidates have been identified in data from both LIGO and Virgo during our preliminary analysis, and we have shared what we currently know with astronomical observing partners. We are working hard to assure that the candidates are valid gravitational-wave events, and it will require time to establish the level of confidence needed to bring any results to the scientific community and the greater public. We will let you know as soon we have information ready to share. The picture shows the Virgo duty cycle during the whole data taking period: we have been taking science data more than 80% of the time over four weeks! Virgo is an interferometric gravitational-wave antenna. It consists of two 3-kilometre-long arms, which house the various machinery required to form a laser interferometer. A beam-splitter divides a laser beam into two equal components, which are subsequently sent into the two interferometer arms. In each arm, a two-mirror Fabry-Perot resonant cavity extends the optical length from 3 kilometres to approximately 100. This is because of multiple reflections that occur within each cavity and which consequently amplify the tiny distance variation caused by a gravitational wave. The two beams of laser light that return from the two arms are recombined out of phase so that, in principle, no light reaches the so-called 'dark fringe' of the detector. Any variation caused by an alteration in the distance between the mirrors, produces a very small shift in phase between the beams and, thus, a variation of the intensity of the light, which is proportional to the wave's amplitude. Click here for more information on the Virgo experiment and its science. Interesting events are always being prepared at EGO-Virgo. Please view our Outreach website for details on up and coming, as well as recent, events. Virgo and the LIGO Scientific Community work together in many areas and have a specific agreement on the exchange of data. More information on the work of our LIGO colleagues is available here. More information on the identification and follow up of electromagnetic counterparts of gravitational wave candidate events is available here. Virgo and EGO have also established a scientific forum - the VESF - for astrophysicists and theorists, dedicated specifically to the furthering of scientific knowledge related to Virgo. More information is available here. The Einstein Telescope (ET) project is dedicated to the development of a critical research infrastructure for a third-generation gravitational-wave interferometer. More information about the project, which is supported by the European Commission as part of the Framework Programme 7, is available here. Roles at EGO are advertised on the EGO website. If you are looking for information on an up-coming or recent event, please visit our Outreach website. 56021 Santo Stefano a Macerata – Cascina (Pisa), Italy. As Virgo is located in the countryside, it is not particularly easy to access without a car, as there are no public transport links directly to it. The nearest airport to Virgo is Pisa Galileo Galilei International Airport. If you are travelling by aeroplane and arrive at the Pisa Galileo Galilei International Airport, or by train and arrive at Pisa Central train station, we recommend that you call a taxi (Co.Ta.Pi Radiotaxi Pisa, +39 050 54 16 00) complete your journey to EGO-Virgo. It takes about 20-30 minutes to reach the site coming from Pisa when coming by car. The taxi fare from Pisa to the EGO-Virgo site costs about €35-40. All visitors must present themselves at the site-entrance gate, where they will be met by their EGO contact person. Visitors' vehicles may be parked at the site, in the appropriate parking areas. New Virgo collaborators must complete the association and safety procedures before starting any activity on site. To this end, they should contact the EGO Administration (Building 4, first floor, +39 050 752 522/325) and the Safety and Security Office (Building 1, +39 050 752 416/544). Badges to access the site and an account to access the Virgo documentation will only be granted by the IT department on completion of this process. Address: Via Amaldi, 56021 Santo Stefano a Macerata, Cascina (Pisa), Italy. Addresses: Nikhef, National Institute for Subatomic Physics, Amsterdam, The Netherlands. VU University Amsterdam, Faculty of Sciences, Department of Physics and Astronomy. European Gravitational Observatory - EGO, Cascina (PI), Italy. A full list of members of the Virgo Collaboration and their contact details is available here. Please get in contact if you would like more information.